A sublime garden of rich, yet subtle hues is a touching tribute to a lifetime of memories and special moments that are as varied and dear as this palette of blooms. 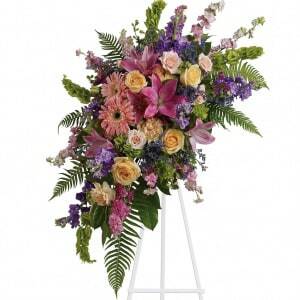 • A lovely assortment of flowers such as pink roses, larkspur, asiatic lilies, gerberas and sinuata statice, with peach roses and carnations, purple stock and limonium, and bells of Ireland on a classic easel. 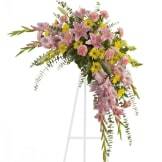 • Arrangement measures approximately 23" W X 30" H.
Flowers will be received by a Sisco Funeral Chapel's staff. This arrangement was absolutely beautiful. It was even more stunning than the picture. We received many complements on it from the family. It was very fresh. I got this spray for my aunt's funeral. It was more beautiful in person. The photo doesn't do it justice. Thank you for making this a perfect transaction during this difficult time. Although I could not be present for the viewing, my cousins were kind enough to send me a picture of the flowers that I had sent from The Sympathy Store - absolutely Beatiful! Their customer service was also very kind and helpful during a difficult time. Tastefully arranged, it fit in perfectly with the other baskets. Our loved one would have approved. So often, ordering flowers is disappointing. Not this time. My family lives in the Atlanta area, but our daughter was able to fly down for the visitation. She was so surprised and happy to see the flowers were beautiful and exactly as ordered from the web site. Thank you for excellent service. The spray was beautiful, fresh and delivered within hours of order. Couldn't have asked for anything more. The flowers sent to my grandmother's funeral were gorgeous. They looked just like the photo. 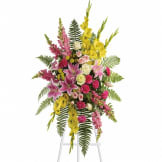 All of our flowers are designed and delivered by hand from a local florist in in Springdale.